Evans Farm broke ground in late 2016. 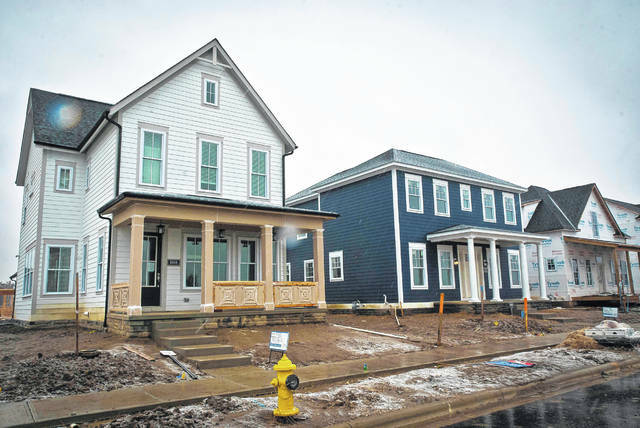 On Wednesday, Tony Eyerman, co-owner of the Evans Farm Land Development Company, said the first few homes (pictured) of the new walkable community in Lewis Center will be ready for move in a few weeks before Christmas. Eleven years ago, Tony Eyerman and Dan Griffin, co-owners of the Evans Farm Land Development Company, began approaching property owners, county, and township officials to share their vision of a new urbanism that would create a 1,250-acre walkable community known as Evans Farm. Evans Farm broke ground in late 2016, and the first year involved the installation of the infrastructure of the community —sewer and utilities. Eyerman said it will be 2030 before Evans Farm is fully built out. Eyerman and Griffin both intend to build homes of their own and live in the community they have created. Evans Farm, a mixed-use urbanism community, is located in southern Delaware County in Lewis Center on Lewis Center Road. The development has been zoned for 2,182 single-family lots and 900 mixed-use attached multifamily units (apartments), featuring traditional architectural styles including craftsman, Cape Cod and Victorian. The development will contain a number of shops, restaurants, 350 acres of park space and two scenic lakes stocked with fish. Everything within Evans Farm will be within walking or biking distance of each other. Eyerman said there are a number of barns the group is looking at to refurbish and use as community centers. Eyerman said 60 acres of the 350 acres of park space is being looked at to build six tournament-style baseball fields with stadium seating. He said the way the zoning is written for the park, it will be used for baseball tournaments, but must remain accessible to the general public. Eyerman also mentioned that YMCA of Central Ohio has signed a letter of intent to build a facility within the walkable community. Recently, the Building Industry Association of Central Ohio (BIA) announced that Evans Farm will host the 2019 BIA Parade of Homes, which will mark the 13th time Delaware County has hosted the event. Over the past three years, the event had been situated around the Labor Day weekend in September, but this time around, the event will take place July 13-28, 2019. Ciacchi said she looked at the past years of the event back to 2009 and found that until 2015, all the dates were in the summer months. “This way we don’t have to compete with kids going back to school, and September has been rainy the last couple of years,” she said. Earlier this year, Eyerman and Griffin had received word of the 2019 Parade of Homes being at Evans Farm but couldn’t release the information until the official announcement was made by BIA. The 2019 event will feature 14 homes built by 12 builders: 3 Pillar Homes, ALTA Design Build, Arthur Rutenberg Homes, Bob Webb Homes, Coppertree Homes, Cua Builders, Guzzo & Garner Custom Builders, Kenric Fine Homes, Maronda Homes, P & D Builders, Sierra Custom Homes and Stonecliff Homes. The upcoming Parade of Homes is sponsored by America’s Floor Source, EverDry Waterproofing and James Hardie Building Products. Parade of Homes information is available at http://biaparade.com. More information on Evans Farm can be found at evansfarmoh.com.